Iconic Pabst Beer Brands Sold To Russian Company : The Two-Way Pabst Brewing Co., with its famous Blue Ribbon, Old Milwaukee and Schlitz labels, is being acquired by Russian brewer Oasis Beverages for an undisclosed sum. 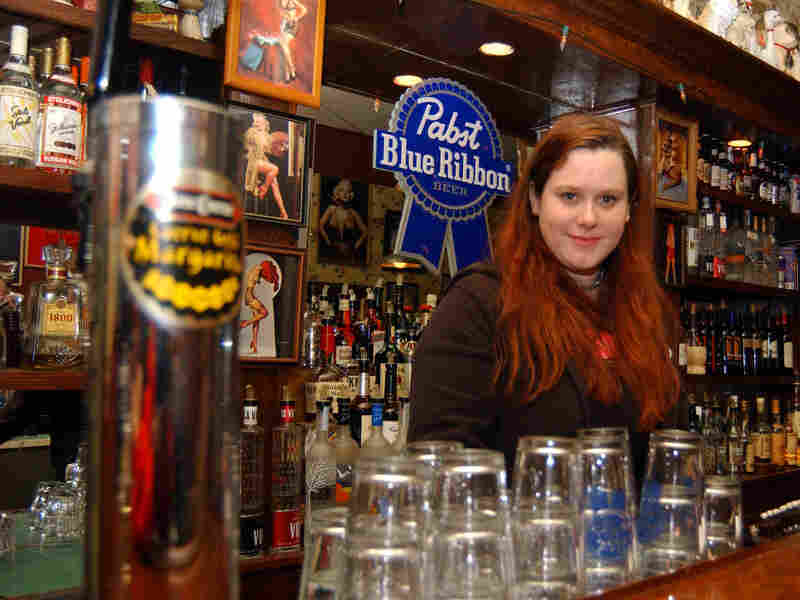 Elizabeth Lessner stands behind the bar at Betty's Food and Spirits in Columbus, Ohio, in 2004. The iconic American Pabst Blue Ribbon brand will soon be owned by a Russian company under a deal to sell the Los Angeles-based brewer for an undisclosed sum. "Oasis has operations in Russia, Ukraine, Kazakhstan and Belarus, according to its website. As well as beer, the company makes soft drinks and juice. "TSG, which invests in consumer brands, has previously owned stakes in vitamin water and Muscle Milk maker Cytosport Holdings Inc."
In a statement, Eugene Kashper, the chairman of Oasis, who will become the new CEO of Pabst, called the beer "the quintessential American brand — it represents individualism, egalitarianism, and freedom of expression — all the things that make this country great." "The opportunity to work with the company's treasure trove of iconic brands, some of which I started my career selling, is a dream come true," he said in the statement. "It will be an honor to work with Pabst's dedicated employees and partner distributors as we continue to build the business." The statement said that the company would remain headquartered in Los Angeles. "Pabst was founded in Milwaukee in 1844 by Jacob Best and later sold to beer tycoon Paul Kalmanovitz. The company was later left in a charitable foundation after Kalmanovitz's death until a judge declared that it had to be sold. Metropoulos, who works with his sons Daren and Evan, bought Pabst from Kalmanovitz Charitable Foundation in 2010 for $250 million. "Metropoulos announced in March he was seeking a new owner for Pabst. The brewery was expected to fetch between $500 million and $1 billion, according to some estimates."